Holy cow you guys! 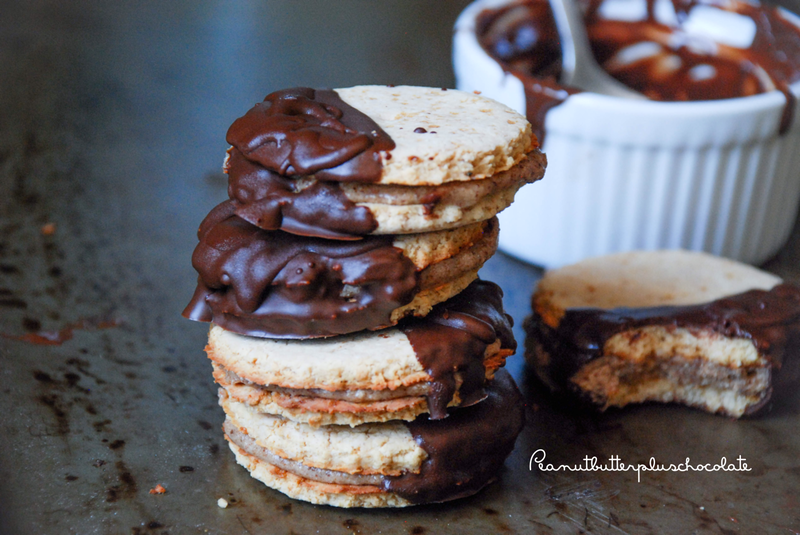 These almond butter stuffed shortbread cookies are to die for. I’ve been messing around with protein powder shortbread recipes for the last few days and I think I finally found one that I love. It has just enough crunch but also not too dry or chalky. 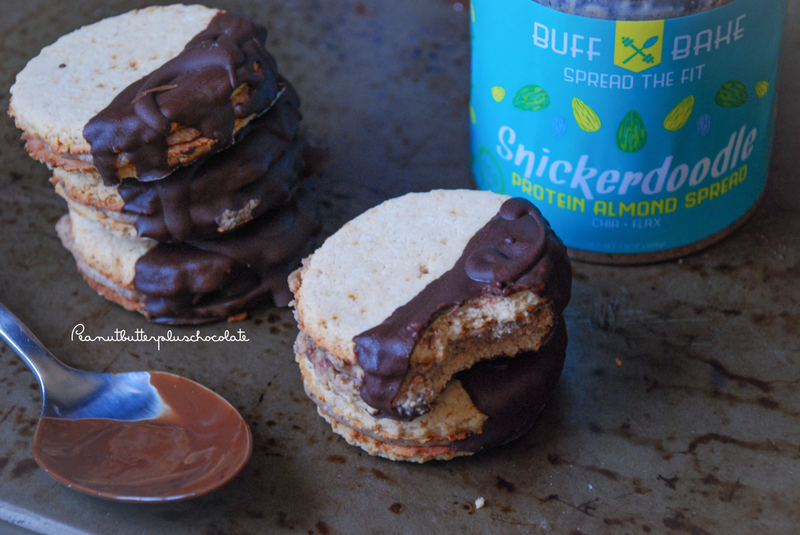 I couldn’t have just a plain old shortbread cookie though, so I stuffed it with my favorite chia, flax Snickerdoodle Almond Spread from Buff Bake (get 10% off your order at buffbake.com using my code PBCHOCO). But I still wasn’t satisfied so I dipped them in some dark chocolate, thus creating the perfect cookie sandwich–boyfriend aprroved! 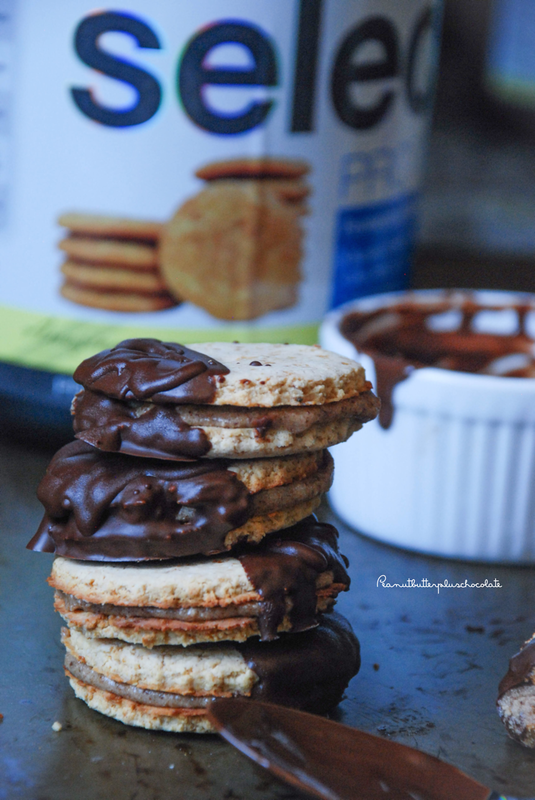 Sticking with a snickerdoodle theme, I used my favorite protein powder– Select Protein by PEScience, Snickerdoodle Flavor. You get 25% off your entire PEScience order by using my code PBCHOCO. Recipe makes 6 sandwich cookies. Mix all dry ingredients for the cookies and then add the wet. Roll dough until it’s 1/4″ thick and cut into cookie shapes. Repeat until you have used all the dough. Mine made 12 cookies using about a 1 1/2″ cookie cutter. Place cookies on a baking sheet lined with parchment paper and bake for 7 minutes at 350f. While cookies cool, melt almond butter and coconut oil together in a microwave safe bowl. Fold in protein powder until combined. Evenly distribute almond butter mix between six of the cookies and make a sandwich with the other six. Melt chocolate and coconut oil in a microwave safe bowl. Spoon chocolate over half of the cookies and place them in the freezer until chocolate hardens (about 10 minutes).